This is the season when graduates are urged to reach for the stars, but what if you leap headlong into a career or relationship that doesn’t feel right? No one wants to be labeled a quitter, but sometimes quitting is the best thing to do. In "Mastering the Art of Quitting: Why It Matters in Life, Love, and Work" (Da Capo), coauthors Peg Streep and Alan Bernstein explain why it can be so hard to give up, even in the face of extreme unhappiness. There should be no shame in quitting, they argue, if it’s a carefully considered decision and the first step to redefining your goals. Growing up, few of us learn when to keep going toward a long-range goal and when to consider stopping. Knowing how and when to quit involves initiating a set of steps, a process known as goal disengagement. Maybe you assume that "just stop" is all you need to know. But it's more complicated than that, according to Mastering the Art of Quitting: Why It Matters in Life, Love, and Work, by Peg Streep, the author or coauthor of 11 books, and Alan Bernstein, LCSW, who has served on the faculty at New York Medical College and New York University. "People tend to persevere longer than they should," he said. So by the time you finally exit, you might have stacked up more emotional baggage than you can handle. Expect to go through stages of grief — maybe a few at the same time. Finding job satisfaction may require more than a higher salary: It might mean packing up and taking your work elsewhere. Quitting can be the first step toward reinvention. 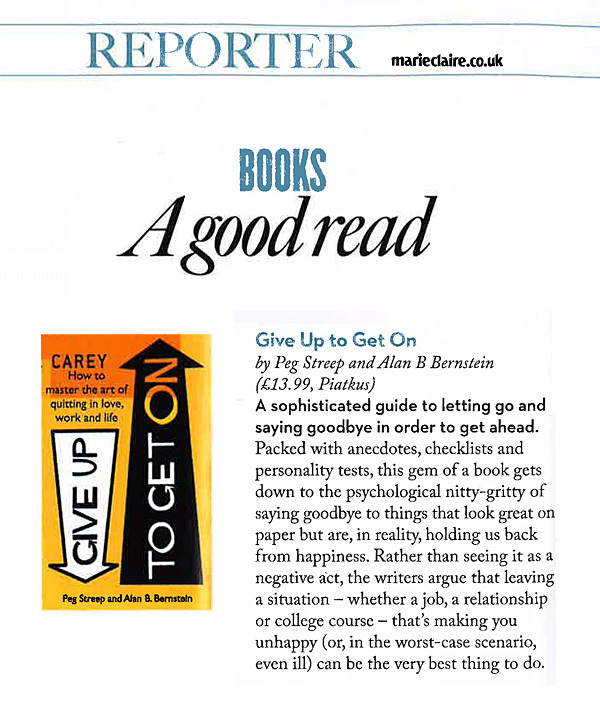 The Times reviewed three books that encourage unhappy employees to walk out the door and start again. The process may be a struggle, but these books point to success stories. In Mastering the Art of Quitting, for example, Peg Streep and Alan Bernstein reject the "myth of persistence." The book, said our reviewer, Liesl Schillinger, "breaks down obstacles to quitting, illustrated by exemplary stories of men and women who had the courage to gracefully quit jobs that did not satisfy them." All right, so you’ve finally decided to quit: Now what? In Mastering the Art of Quitting, authors Peg Streep and Alan Bernstein offer hardnosed advice on how to separate yourself from a job that’s not doing it for you. When it comes to quitting, Streep and Bernstein argue that people tend to rationalize to find reasons to stay, dragging out the experience. The authors reclassify quitting as a positive, healthy action. After all, they write, when you stick around at a gig that’s not allowing you be your best self, you cut yourself short. From feeling like you've already invested too much to being surrounded by physical reminders of your efforts, it can seem really tough to move on from something that's not working. But Alan Bernstein, co-author of Mastering the Art of Quitting: Why It Matters in Life, Love, and Work (Da Capo Lifelong Books, 2013) thinks you can master the art of quitting, and save yourself lots of heartache. He shares his advice. As 2014 looms, if you're centering your New Year's resolutions on things like exercising, improving your self-discipline and communicating better with loved ones, but ignoring trouble spots where drastic action is needed (like quitting a dead-end job or ending a doomed relationship), you are not alone. According to the authors Peg Streep and Alan Bernstein: "American mythology doesn't have room for quitters. In fact, the only kind of giving up we collectively accept and support is quitting a bad habit like smoking or drinking." As we can see from a recent Planet Money story on NPR, millions of people are quitting their jobs each month, and Janet Yellen of The Fed thinks this is a good sign. She says if people are quitting in high numbers, that signals they're sure better jobs are available. In other words, a strong signal for the economy. Just as persistence has had a deservedly positive reputation as a trait, my guest on the show says quitting the right way and for the right reasons is also healthy and necessary in life. Beginning with stories told at childhood, like "The Little Engine That Could," we're taught never to quit. John Munson's guest this hour says these lessons are well-intentioned but wrong. Find out why quitting is actually an important part of achieving our goals and how, exactly, to do it. Who wants to be called a quitter? In this "I think I can, I think I can" culture, probably nobody. But the writers of this counter-intuitive book, author and Psychology Today blogger Peg Streep and licensed clinical social worker Alan Bernstein, say that sometimes quitting is exactly what you need to do. A sophisticated guide to letting go and saying goodbye in order to get ahead. Packed with anecdotes, checklists and personality tests, this gem of a book gets down to the psychological nitty-gritty of saying goodbye to things that look great on paper but are, in reality, holding us back from happiness. Rather than seeing it as a negative act, the writers argue that leaving a situation - whether a job, a relationship or college course - that's making you unhappy (or, in the worst-case scenario, even ill) can be the very best thing to do. The human brain – which is hard-wired for persistence - and modern culture both disdain a "quitter." However, the concept that you’ve put in too much work by now to give up can blind you to new possibilities. Peg Streep and Alan Bernstein show you how to push through those mental blocks. They detail how to use "goal mapping" to reinvent yourself, and they explain why "intrinsic goals" built around personal growth yield greater rewards than "extrinsic goals" that depend on the approval of others. The authors cite psychological experiments that explain how your brain predisposes you to persist, even when giving up is a better choice. It's that time of year when we take inventory of our lives - what's working, what's not working, and what we want to change when it comes to our relationships, our jobs, our finances, our habits, etc. Change isn't always easy particularly when it requires that we admit our failures and give up on our goals. 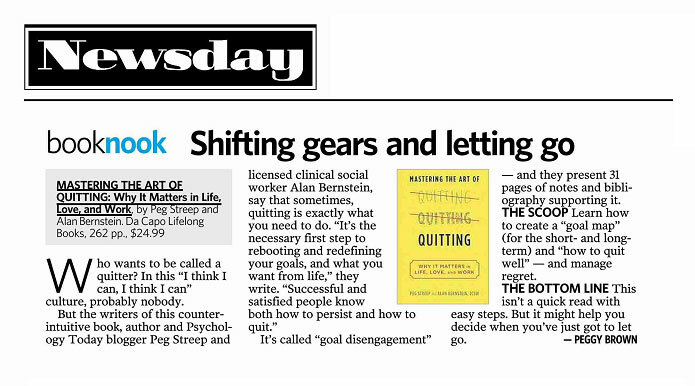 In his new book, Mastering the Art of Quitting, psychotherapist ALAN BERNSTEIN, argues that the most satisfied people have figured out to do just that - quit, refocus and redefine in order to move forward with their lives. As the new year begins, we'll talk with therapist and author Alan Bernstein about when and how to quit. In our culture, quitting anything other than a bad habit has a negative connotation - but you argue that quitting is positive. What are some situations in which quitting is beneficial? Rumination and self-doubt can be physically exhausting.If you find yourself in an endless loop hoping for a positive outcome, it's likely you’re operating in an energy deficit. Prolonged periods can impact your health. So, watch your moods and physical sense of well-being; are you routinely exhausted? Unable to enjoy activities other than prescribed ones? If so, you may be in a locked situation where you should consider whether quitting is a healthier choice. Retirement is around the corner, and although you are fairly well prepared for it financially, you are starting to wonder what you will do with all that free time. How can you prepare for this new stage of life? There's a growing sense in the U.S. that our destiny is our own, that we create our own paths in life," said Alan Bernstein, co-author of "Your Retirement, Your Way" (McGraw-Hill, 2006). "This has loosened the idea that people should do what they are best at, what they most enjoy, rather than what they've been trained to do.